Mount Gerizim (/ˈɡɛrɪˌzɪm/; Samaritan Hebrew: ࠄࠟࠓࠂࠟࠓࠩࠆࠝࠉࠌ translit. ʾĀrgārēzem; Hebrew: Tiberian Hebrew הַר גְּרִזִים translit. Har Gərīzīm, Modern Hebrew: הַר גְּרִיזִים translit. Har Gərizim; Arabic: جَبَل جَرِزِيم‎ Jabal Jarizīm or Arabic: جبل الطور‎ Jabal et Tur) is one of the two mountains in the immediate vicinity of the West Bank city of Nablus (biblical Shechem), and forms the southern side of the valley in which Nablus is situated, the northern side being formed by Mount Ebal. The mountain is one of the highest peaks in the West Bank and rises to 881 m (2,890 ft) above sea level, 70 m (230 ft) lower than Mount Ebal. In Samaritan tradition, Mount Gerizim is held to be the highest, oldest and most central mountain in the world. The mountain is particularly steep on the northern side, is sparsely covered at the top with shrubbery, and lower down there is a spring with a high yield of fresh water. A Samaritan village, Kiryat Luza, and an Israeli settlement, Har Brakha, are situated on the mountain ridge. The mountain is sacred to the Samaritans who regard it, rather than Jerusalem's Temple Mount, as having been the location chosen by God for a holy temple. The mountain continues to be the centre of Samaritan religion to this day, and most of the worldwide population of Samaritans live in very close proximity to Gerizim, mostly in Kiryat Luza, the main village. Passover is celebrated by the Samaritans on Mount Gerizim, and it is additionally considered by them as the location of the Binding of Isaac (the Masoretic Text, Septuagint and the Dead Sea Scroll versions of the Book of Genesis state that this happened on Mount Moriah, which Jews traditionally identify as the Temple Mount). According to rabbinic literature, in order to convert to Judaism, a Samaritan must first and foremost renounce any belief in the sanctity of Mount Gerizim. Moses instructed the Israelites, when first entering Canaan, to celebrate the event with ceremonies of blessings and cursings on Mount Gerizim and Mount Ebal respectively. The Pulpit Commentary suggests that these mountains were selected for blessings and curses "doubtless, because of their relative position, and probably also because they stand in the center of the land both from north to south, and from east to west". It has been suggested that "Ebal was appointed for the uttering of the curse, and Gerizim for the uttering of the blessing, because the former was barren and rugged, the latter fertile and smooth", but the Pulpit Commentary editors state that "this is not borne out by the actual appearance of the two hills, both being equally barren-looking, though neither is wholly destitute of culture and vegetation". However, the Cambridge Bible for Schools and Colleges argues that "the [north] face of Gerizim, the mount of blessing, is the more fertile; the opposite face of Ebal, the mount of curse, much the more bare." 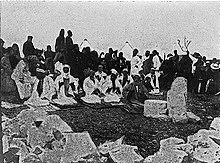 The Masoretic Text of the Tanakh says the Israelites later built an altar on Mount Ebal, constructed from natural (rather than cut) stones, to place stones there and whiten them with lime, to make korban (peace offerings on the altar), eat there, and write the words of this law on the stone. The Samaritan Pentateuch version of Deuteronomy, and a fragment found at Qumran, holds that the instruction actually mandated the construction of the altar on Mount Gerizim, which the Samaritans view as the site of the tabernacle, not Shiloh. Recent Dead Sea Scrolls work supports the accuracy of the Samaritan Pentateuch's designation of Mount Gerizim rather than Mount Ebal as the sacred site. An instruction immediately subsequent to this orders that, once this is done, the Israelites should split into two groups, one to stay on Mount Ebal and pronounce curses, while the other goes to Mount Gerizim and pronounces blessings. The tribes of Simeon, of Levi, of Judah, of Issachar, of Joseph, and of Benjamin were to be sent to Gerizim, while those of Reuben, of Gad, of Asher, of Zebulun, of Dan, and of Naphtali, were to remain on Ebal. No attempts to explain this division of tribes either by their Biblical ethnology or by their geographical distribution have been generally accepted in academic circles. The text goes on to list twelve curses, which were to be pronounced by the Levite priesthood and answered by the people with Amen. These curses heavily resemble laws (e.g. "cursed be he who removes his neighbour's landmark"), and they are not followed by a list of blessings described in a similarly liturgical framework; some scholars believe that these more likely represent what was written on the stones, and that the later list of six explicit blessings, six near-corresponding explicit curses, were originally in this position in the text. The present position of these explicit blessings and curses, within a larger narrative of promise, and a far larger narrative of threat (respectively), is considered by these scholars to have been an editorial decision for the post-Babylonian-exilic second version of Deuteronomy (Dtr2), to reflect the Deuteronomist's worldview after the Babylonian captivity had occurred. Samaritans' Passover pilgrimage on Mount Gerizim. In the Book of Joshua, after the Battle of Ai, Joshua built an altar of unhewn stones there, the Israelites then made peace offerings on it, the law of Moses was written onto the stones, and the Israelites split into the two groups specified in Deuteronomy and pronounced blessings and curses as instructed there. There is some debate between textual scholars as to whether this incident in Joshua is one account or two different accounts spliced together, where one account refers to Joshua building an altar, and making sacrifices on it, while the other account refers to Joshua placing large stone slabs there that had been whitened with lime and then had the law inscribed on them. Either way there are some who believe that the sources of Joshua predate Deuteronomy, and hence that the order to build the altar and make the inscription is likely based on these actions in the sources of Joshua, rather than the other way round, possibly to provide an etiology for the site acceptable to the deuteronomist's theology. Much later in the Book, when Joshua was old and dying, he gathered the people together at Shechem, and gave a farewell speech, and then wrote these words in the book of the law of Yahweh, and set up a stone as a witness, placing it next to the sanctuary of Yahweh, under the oak tree. Depending on the way in which the sources of Joshua were spliced together, this may just be another version of the earlier narrative Joshua placing the whitened stones slabs with the law inscribed on them, and some scholars believe that this narrative may have originally been in an earlier location within the Book of Joshua. Scholars consider it plausible for the sanctuary to have been pre-Israelite. It is possible that the name of the mountain is indicative of this, as it is thought that Gerizim may mean mountain of the Gerizites, a tribe in the vicinity of the Philistines that, according to the Hebrew Bible, was conquered by David. 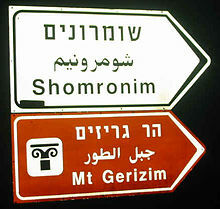 A straightforward etymology for Gerizim would give the meaning of mountain cut in two. According to the narrative about Jotham in the Book of Judges, Shechem was a site where there was a sanctuary of El-Berith, also known as Baal-Berith, meaning God of the covenant and Lord of the covenant, respectively; scholars have suggested that the Joshua story about the site derives from a covenant made there in Canaanite times. 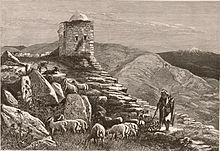 In the narrative of Judges, the pillar that was in Shechem is seemingly significant enough to have given its name to a nearby plain, and this pillar is thought to be likely to have been a totem of El-Berith; the Joshua story, of a stone being set up as a witness, simply being an attempt to provide an aetiology in accordance with later Israelite theology. In the Biblical narrative, the oak tree, seemingly next to the sanctuary, was evidently in existence as early as the time of the Patriarchs, as Jacob is described in the Book of Genesis as having buried the idols of strange gods (formerly worshipped by his household) beneath it. According to a Jewish midrash, one of these idols, in the shape of a dove, was later recovered by the Samaritans, and used in their worship on Mount Gerizim. After the end of the Babylonian Captivity, a large schism between the Samaritans and Judaism developed, with the Samaritans, but not the Jews, regarding Mount Gerizim as the holy place chosen by God. Subsequently, in the Persian Period, the Samaritans built a temple there probably in the middle of 5th century BCE., arguing that this was the real location of the Israelite temple which had been destroyed by Nebuchadnezzar. The religious tension between the Jews and the Samaritans led to the temple on Gerizim being destroyed by either John Hyrcanus in the 2nd century BCE (according to Josephus) or by Simeon the Just (according to the Talmud). The date of the Samaritan temple destruction, the 21st of Kislev, became a holiday for the Jews during which it is forbidden to eulogize the dead. However, the mountain evidently continued to be the holy place of the Samaritans, as it is mentioned as such by the Gospel of John and coins produced by a Roman mint situated in Nablus included within their design a depiction of the temple; surviving coins from this mint, dated to 138–161 CE, show a huge temple complex, statues, and a substantive staircase leading from Nablus to the temple itself. Eventually, when Christianity became the state church of the Roman Empire, Samaritans were barred from worshiping on Mount Gerizim. In 475 CE a Christian church was built on its summit. In 529, Justinian I made Samaritanism illegal, and arranged for a protective wall to be constructed around the church. As a result, the same year, Julianus ben Sabar led a pro-Samaritan revolt, and by 530 had captured most of Samaria, destroying churches and killing the priests and officials. However, in 531, after Justinian enlisted the help of Ghassanids, the revolt was completely quashed, and surviving Samaritans were mostly enslaved or exiled. In 533 Justinian had a castle constructed on Mount Gerizim to protect the church from raids by the few disgruntled Samaritans left in the area. As a result of the fortified church and previous Samaritan temple, extensive ruins still exist at the somewhat plateau-like top of Gerizim. The line of the wall around the church can easily be seen, as can portions of the former castle, and initial archaeological study of the site postulated that the castle built by Justinian had utilised stones from an earlier structure on the site (probably the Samaritan temple). In the centre of the plateau is a smooth surface, containing a hollow, which archaeologists consider to be reminiscent of dolmens found in southwestern Syria, and which Samaritans consider to be a portion of their former temple. Ruins on Mount Gerizim c1880. A more substantial archaeological survey was undertaken in the middle of the 20th century, while the site was in the possession of Jordan, in the region of the mountain known as Tel el-Ras, situated on the northernmost peak at the end of the northern ridge. This excavation, which continued under Israel's jurisdiction, uncovered Corinthian columns, a large rectangular platform (65m by 44m) surrounded by 2m thick and 9m high walls, and an 8m wide staircase leading down from the platform to a marbled esplanade. The complex also has a series of cisterns in which Late Roman ceramics were found. These discoveries, now named "Structure A", have been dated to the time of Hadrian, due to numismatics and external literary evidence, and are believed to be a temple dedicated to Zeus. Underneath these remains were found a large stone structure built on top of the bedrock. This structure, now known as "Structure B", nearly half cubic (21m by 20m in width and length, and 8.5m high), consists almost entirely of unhewn limestone slabs, fitted together without any binding material, and has no internal rooms or dividing walls. The structure was surrounded by a courtyard similar to the platform above it (being 60m by 40m in size with 1.5m thick walls), and was dated to during or before the Hellenic era by ceramics found in a cistern cut into the bedrock at the northern side. The excavating archaeologist considered "Structure B" to be the altar built by the Samaritans in the 5th or 6th century BCE. ^ "Photograph of this". Retrieved 2014-05-01. ^ Pulpit Commentary on Deuteronomy 11, accessed 2015-11-25. ^ Cambridge Bible for Schools and Colleges on Deuteronomy 11, accessed 2015-11-25. ^ "An Unknown Dead Sea Scrolls Fragment of Deuteronomy James H. Charlesworth". Ijco.org. Archived from the original on 2011-12-10. Retrieved 2014-05-01. ^ Charlesworth, James H. (2012-07-16). "The Discovery of an Unknown Dead Sea Scroll: The Original Text of Deuteronomy 27?". OWU Magazine. Archived from the original on 2015-11-26. ^ "Genesis 35:4". Bible.cc. Retrieved 2014-05-01. ^ "Megillat Taanit". attalus.org.il. Retrieved 2016-09-21. Wikimedia Commons has media related to Mount Gerizim.